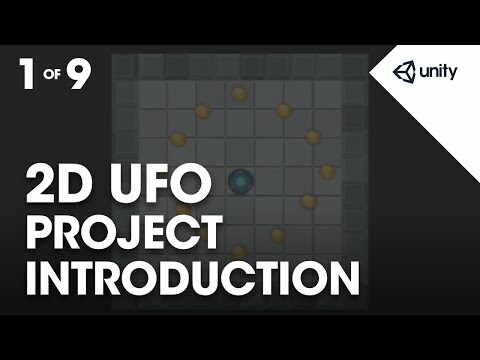 An introduction to the 2D UFO project in which we set up the project and download the required assets. from the beginner tutorial modules. where we'll be collecting gold nuggets. We'll move the UFO using physics and forces. making it move in our scene. game objects have been picked up. Let's begin by creating a new project. if you haven't done that already. choosing File - New Project. This will bring us to the home screen. I'm going to call the project UFO Game. destination, or path, to our new project. I'm going to put this new project on my desktop. to either 3D or 2D mode. I'm going to click 2D. to create our new project. for us to work in. from the Unity Asset Store. or control + 9 on windows. all the way up to complete games and projects. you learn how to make games. opened as a docked tab. we'll see a listing of asset categories. a subcategory called Sample Projects. an item called 2D UFO tutorial. Click on the item title to open it. download button in the upper-left corner. once we click on it. a dialogue labelled Importing Complete Project. new project this is fine. Click the Import button to continue. import in to our project. so go ahead and click Import. Close the Asset Store window. We now have our new project with our assets imported. And the default new empty scene open. we need to save our scene. or control + S on windows. I'm going to call the scene Main. were all created when we imported our asset package. which you can refer to if you get stuck. Great, that's the end of our first lesson. In our next lesson we're going to lay out our play field.